What if depression could lead to positive change? 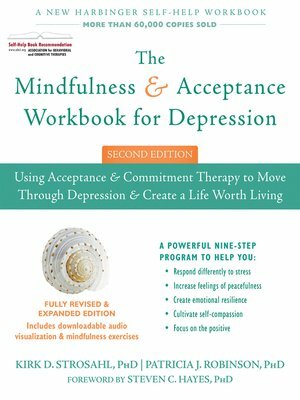 Written by acceptance and commitment therapy (ACT) cofounder Kirk Strosahl and Patricia Robinson, this revised edition of the best-selling classic, The Mindfulness and Acceptance Workbook for Depression includes updated research on self-compassion, mindfulness, and neuroscience to help you live a more meaningful life. If you suffer from depression, you may feel like you are living under a perpetual raincloud, even when it's sunny outside. If left untreated, clinical depression can damage relationships, cause problems at work, lead to substance abuse, and even make it more difficult to overcome physical illnesses. You may feel too tired and scared to reach out for help, or you may try to avoid your feelings altogether. But you should know that there are little, effective ways you can overcome your depression, one day at a time. This fully revised and updated second edition of The Mindfulness and Acceptance Workbook for Depression will show you how changing daily behaviors and practicing new mindfulness skills can literally reshape your brain. Rather than fruitlessly trying to avoid your depression, you'll learn to focus on living a productive life by accepting your feelings. There are hundreds of books that will try to help you overcome or put an end to depression. But what if you could use your depression to change your life for the better? Your symptoms may be signals that something in your life needs to change. Learning to understand and interpret these signals is much more important than ignoring or avoiding them—approaches that only make the situation worse. This workbook uses techniques from acceptance and commitment therapy (ACT) to offer a new treatment plan for depression that will help accept your feelings instead of fruitlessly trying to avoid them. This new edition will include skills based on new research and contributions from mindfulness, self-compassion, and neuroscience. Using the skills outlined in this book, you'll be able to work through your depression, experience greater peace and well-being, and go on to create a better life.